Series LFMMV Thermostatic Mixing Valves maintain and limit mixed hot water to a desired, selectable temperature. The LFMMV series can be set to any temperature between 80 deg F and 120 deg F with flow rates as low as 0.5 gpm and as high as 12 gpm (refer to capacity chart on back). This mixing valve series is listed under ASSE 1017 for valves used in hot water source applications, ASSE 1069 for single-pipe, tempered water applications and ASSE 1070 for valves used in individual or multiple fixture applications and also listed IAPMO cUPC. The LFMMVs feature Lead Free construction to comply with Lead Free installation requirements. The LFMMV-M1 uses a double throttling design to control both the hot and cold water supply to the mixed outlet. 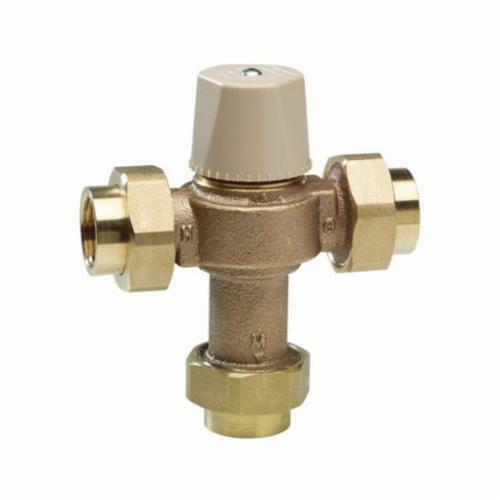 The superior flow characteristics of this valve provide accurate temperature control (+/-3 deg F) with low pressure drop across the rated flow range. As an added feature, the LFMMV-M1 series incorporates integral inlet filter washers and check valves in both the hot and cold water inlets to protect against cross flow. The LFMMV-M1 is available with either union thread (-UT), union solder (-US), CPVC (-CPVC ) Quick-Connect (-QC) or PEX (-PEX) end connectors. Maximum Pressure: 150psi (10.55 bar).